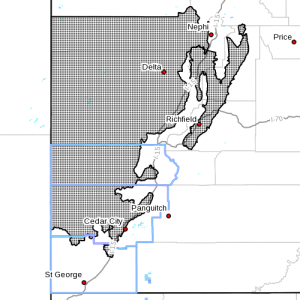 SOUTHERN UTAH – The National Weather Service in Salt Lake City has issued a “Hard Freeze Warning” for Washington, Iron and Beaver counties. The warning is in effect from 11 p.m. Sunday until 9 a.m. Monday. 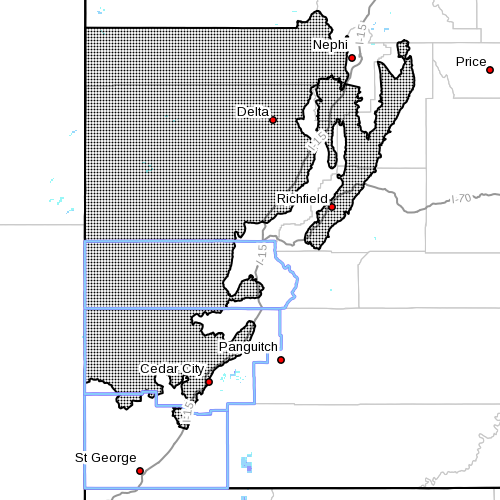 Areas affected by the warning are the Sanpete and Sevier valleys, west central Utah and southwest Utah. Cities affected include Cedar City, Beaver, Richfield, Manti, Delta, Fillmore and Milford. Temperatures are expected to drop into the upper 20s. Temperatures are expected to fall below freezing after midnight and reach the upper 20s during the early morning hours on Monday. Temperatures will stay in the 20s until about an hour before sunrise. Sensitive plants can be damaged or die in these cold temperatures. A hard freeze warning means subfreezing temperatures are imminent or highly likely. These conditions will kill crops and other sensitive vegetation.